The Houston Texans were on the clock for the first time as a franchise during the 2002 NFL Draft. With the number-one overall pick, the Texans selected Fresno State quarterback David Carr. As an expansion team, the Texans were awarded the top choice in the 2002 NFL Draft. Despite helping the Texans win their first-ever regular season game (19-10 over the Dallas Cowboys), Houston collected only four victories in Carr’s rookie season. Carr was also sacked a single-season record 76 times. Carr was one of 15 quarterbacks selected in the 2002 NFL Draft. The only future Pro Bowler selected in the top five was North Carolina defensive end Julius Peppers, who was taken by the Carolina Panthers second overall. At number three, the Detroit Lions selected Oregon quarterback Joey Harrington. The Buffalo Bills took offensive tackle Mike Williams fourth, while the San Diego Chargers selected cornerback Quentin Jammer fifth. Several Pro Bowlers were taken after the top 10 in the first round of the 2012 NFL Draft, including tight end Jeremy Shockey, defensive tackle Albert Haynesworth, wide receiver Javon Walker, cornerback Lito Sheppard and safety Ed Reed. Notable players selected in the second round include Andre Gurode, LeCharles Bentley and Clinton Portis. 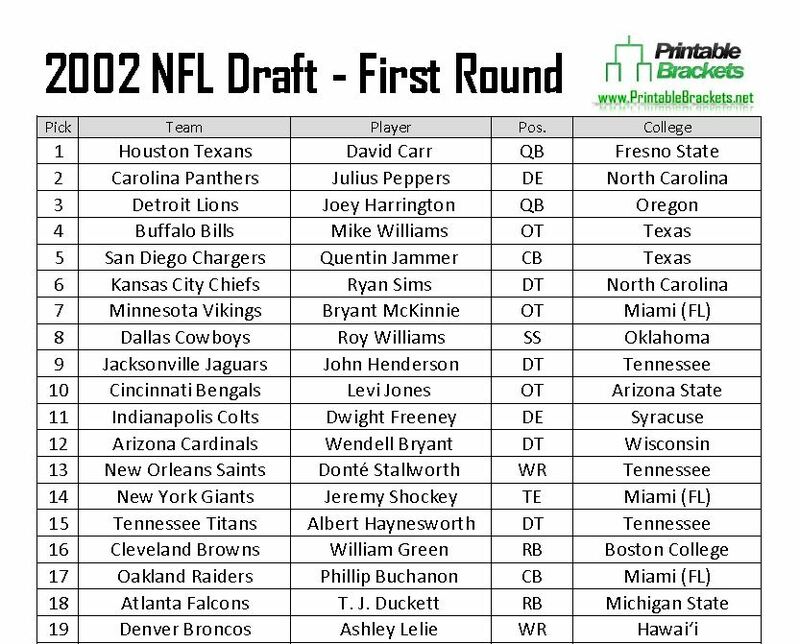 A total of 261 players were selected in the 2002 NFL Draft, an astounding 53 of which were defensive backs. Another 34 wide receivers, 27 linebackers, 24 defensive ends and 23 tight ends were also selected. “Mr. Irrelevant” of the 2002 NFL Draft was UNLV defensive tackle Ahmad Miller, who was taken by the Texans with the 261st overall pick. A number of notable players went on to make the Pro Bowl after going undrafted in 2002. Linebacker Bart Scott, safety Ryan Clark and linebacker James Harrison all went unselected in the 2002 NFL Draft.